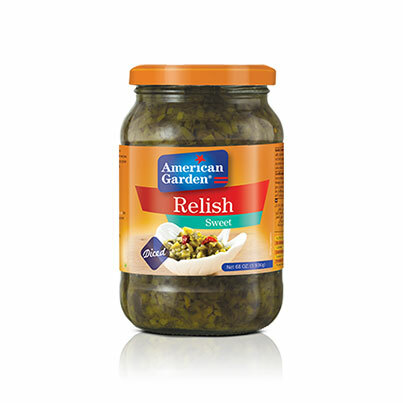 American Garden Sweet Relish is a high-quality product designed to enhance the taste of your recipes. Made with finely diced cucumbers that are pickled in our special brine, it is a perfect ingredient to use in sandwiches. It can also be added to some salads such as potato or pasta salads, and it saves you the hassle of cutting the pickles when preparing tartar. Available in 68oz packages, it is perfect for restaurants and big caterers. Mustard is one of the most popular table condiments in the world. It is also used as a spread on sandwiches and as a main ingredient in vinaigrette, sauces, marinades and dips. 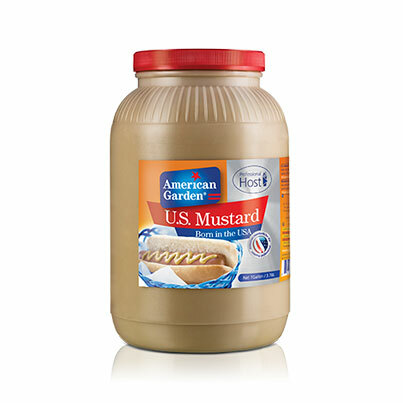 Made from all-natural ingredients including the finest grade mustard seeds, American Garden Mustard is renowned for its tangy taste and soft consistency. Available in 3.78L gallons, it’s perfect for restaurants and caterers’ use. 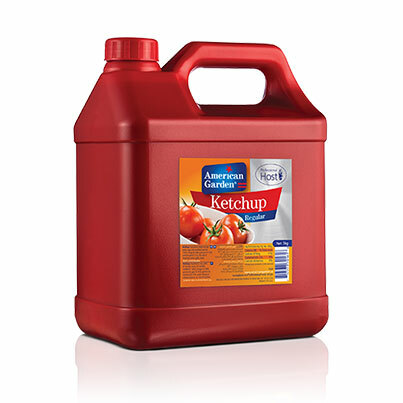 Made from 100% natural ingredients, American Garden Ketchup combines the best natural vine-ripened tomatoes with a special blend of spices to please all tomato lovers. Packed in a 176.4oz gallon or a 113oz can, it is convenient for using in restaurants when preparing sauces, marinades and sandwiches, or to fill table dispensers. It is the most famous dip served next to French Fries, pizzas and crispy chicken tenders. 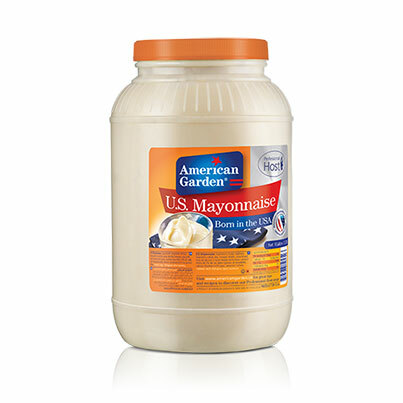 American Garden Mayonnaise offers the best quality in its segment, with an authentic recipe that makes for a perfectly smooth texture and a rich and creamy taste. 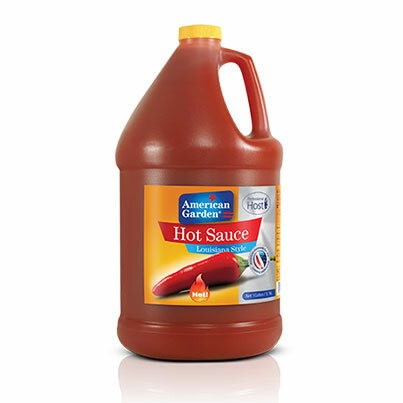 Packed in a gallon size bulk (3.78L), it is perfect to use in hearty sandwiches, fresh salad dressings and burgers! It can also be served as a dipping sauce next to French Fries or deep-fried appetizers. Highly versatile, it is suitable for all catering specialists in the hospitality business. 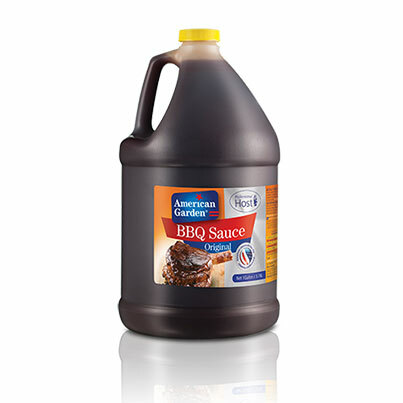 A great American Classic, our BBQ Original Sauce uses an authentic American recipe to ensure the best taste for all your catering needs! This gourmet-quality sauce works great on both meat and chicken. Packed in a 3.78L gallon, it is a great product for restaurants to add a unique taste to their menus. American Garden hot sauce is created from the finest aged chili peppers and natural vinegar to kick up the flavor of your whole menu. Highly versatile, you only need a drop or two to upgrade your marinades and sauces, or to give your fish, chicken and meat a unique taste. It comes in 3.78L gallons and will answer all your restaurants’ needs, from adding it to your signature recipes to filling the empty dispensers on your tables. 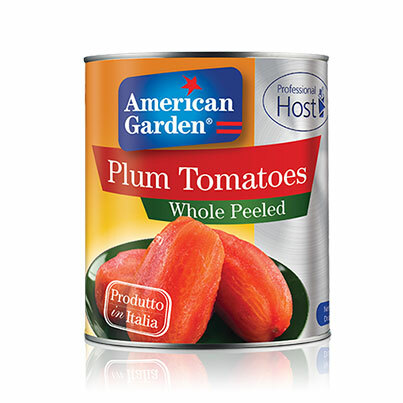 Made with 100% natural plum tomatoes and packed in their own juice, American Garden offers you its wholesome canned Whole Peeled Tomatoes in a professional host size (89.9oz) for restaurants use! Highly versatile, this product is perfect for adding a fresh tomato taste to soups and pasta or pizza sauces, or for preparing a delicious tomato confit to complement a goat cheese salad. Peeled tomatoes can be used directly from the can, for more convenience and time-saving, while no compromises are made on the quality of the dishes you’re serving. 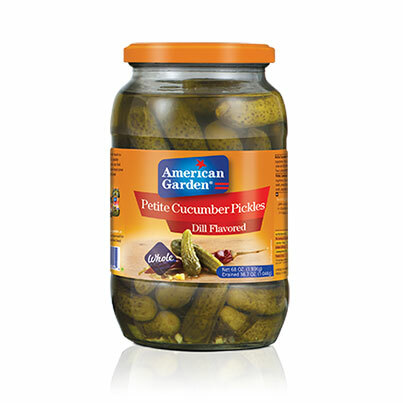 American Garden Petite Dill Pickles are your perfect choice. Crunchy with a hint of vinegar and salt, they will surely suit all your restaurant’s needs, especially that they’re available in 68oz jars. They are a perfect way to add a crunch to your salads or to serve next to most of your sandwiches. They can also be used to upgrade your average cheese or cold cuts platters. 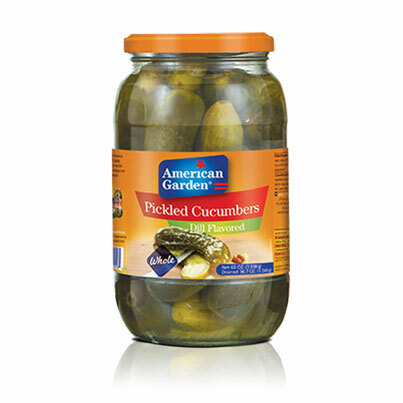 Crunchy and tasty with the right amount of both vinegar and salt, American Garden Dill Pickles are here to answer all your needs. Highly versatile, they can be served with salads, sandwiches and burgers. They can also be chopped to garnish your meals. Available in 68oz packaging, they will soon become a favorite product in your restaurant’s kitchen! 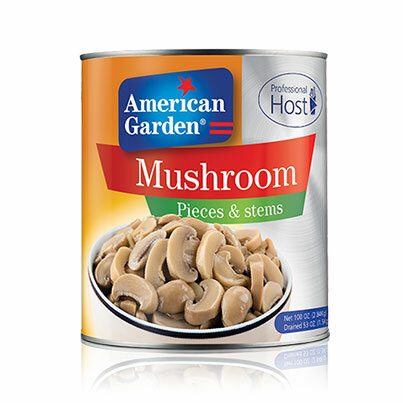 With their perfect texture and their fresh taste, American Garden pieces and stems mushrooms will add a great value to your menu! 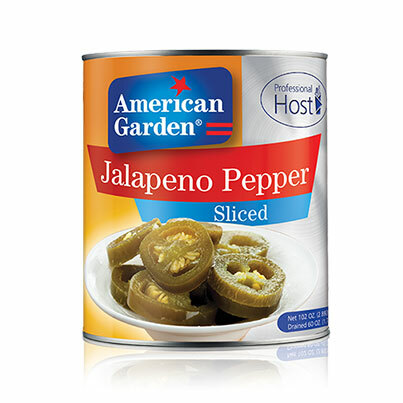 Picked with care, they are canned in natural ingredients to preserve their authentic flavor. Use them to prepare the famous mushroom sauce to serve next to chicken or beef steaks, or add them to your pasta and pizza sauces. Your choices are unlimited especially with the host professional size (100oz)that will make your dishes taste irresistible! There are many ingredients that go into running a successful restaurant, and American Garden’s professional host range is your best solution. 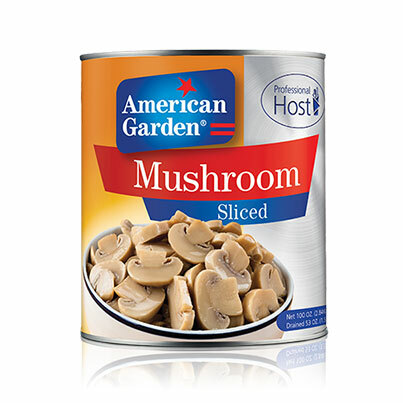 Available in 100oz cans, our sliced mushrooms are highly versatile and can be directly used in your pasta sauces and atop your pizzas or bruschettas. They are also suitable for soups or salads, or to be sautéed and served next to steaks. We pick our products with a lot of care and we always guarantee the best quality! 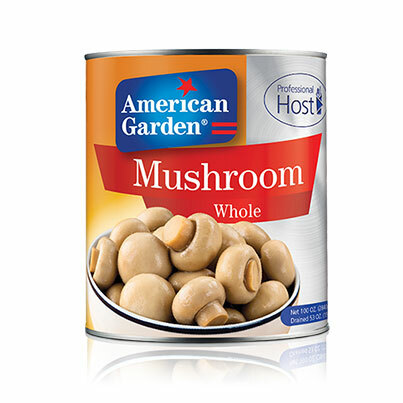 American Garden canned whole mushrooms come in a host professional size (100oz), suitable for catering specialists in the hospitality business. These mushrooms taste as good as fresh, and they’re perfect to use in various dishes, from fresh salads to soups and sides. They can also be added to pasta dishes, curries, stews and chicken or potato bakes. Chosen with care, our mushrooms always guarantee the best quality. 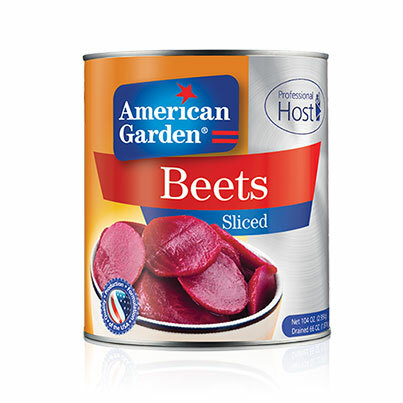 American Garden sliced beets taste as fresh as homemade, and they are ready to use directly from the can, to your restaurant’s convenience. Available in a professional host size (104oz), they are perfect to upgrade all your salads and add a colorful touch to your veggies. Sweet and tender, they will surely please all your customers! 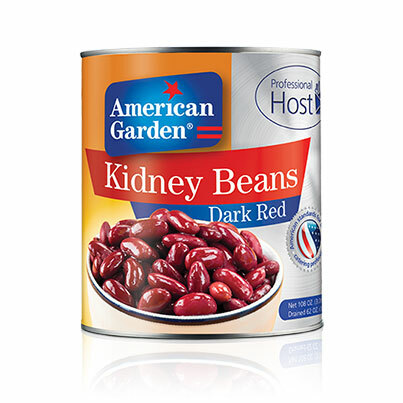 American Garden Red Kidney Beans are picked with care then cooked to perfection to ensure a perfect consistency and a great taste every time. Available in a professional host size (109 oz) for your restaurant’s convenience, they can be easily added to your salads, soups and stews, and will save your chefs some precious time! 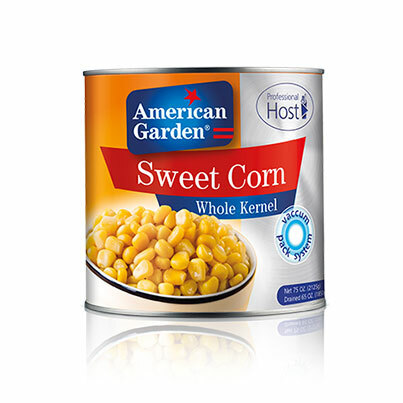 American Garden whole kernel sweet corn in brine is available in a 104oz can, for all restaurants and catering specialists. It is suitable for a wide range of recipes on your menu: it can be tossed in salads, sautéed with other veggies and served next to steaks and roast beef, or simply added to pasta bakes, pizza sauces and casseroles. 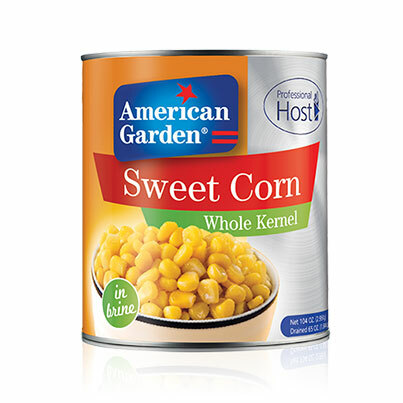 American Garden whole kernel sweet corn is now available in a 78.6oz can for all catering specialists. Versatile, it can be used in different items on your menu: add it to your salads and soups or serve it sautéed with other veggies next to meats. And if you serve Asian delicacies, it’s perfect in rice and noodle dishes. Our can has grown bigger but our corns kept the same tender crunch to please your customers! 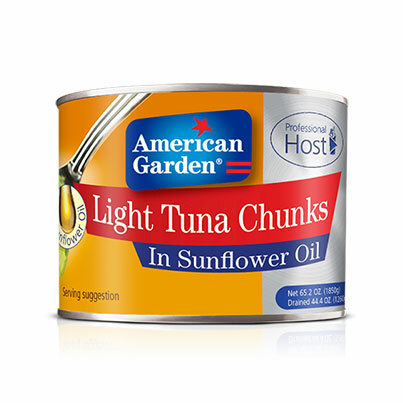 American Garden Light Tuna chunks are available in a professional host package (65.2oz) to cater to all restaurants’ needs. We select premium fish and can it in natural ingredients to ensure the best quality to our customers. Whether you’re planning on adding these chunks to your salads or sandwiches, this product is all you need. 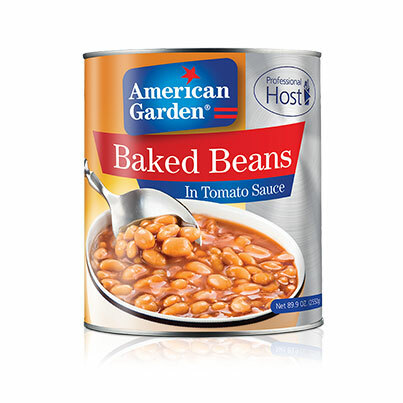 American Garden’s wholesome baked beans will definitely give your clients the homemade taste they’re craving for! A convenient staple enjoyed around the world, these beans come in a sweet flavorful tomato sauce. Available in a professional host size (2.6Kg), they are perfect for restaurants and caterers. Best enjoyed during breakfasts and brunches with hot dogs and sunny side-up eggs, you can also serve them as side dishes next to meats, or as a topping to baked potatoes. Stuffed grape leaves are a staple of many Mediterranean cuisines. They are always part of mezes in restaurants. 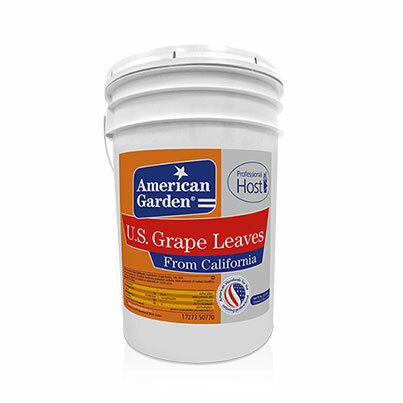 American Garden Grape leaves are handpicked with care to ensure perfect quality and great taste all the time. 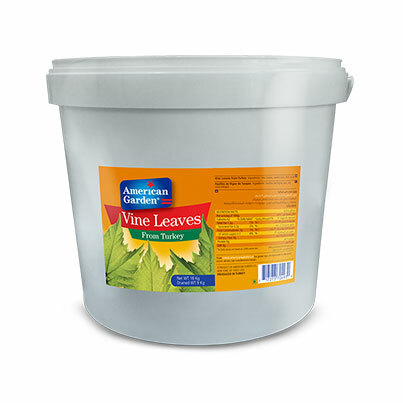 Available in a 50lb bucket size, they are a perfect solution for all restaurants and catering specialists. Hand-picked from the best Turkish vineyards, American Garden delivers the freshest grape leaves in an 18Kg bucket to cater to all your restaurant’s needs. Packed with care, our high-quality leaves are destined to all specialists in Turkish and Middle Eastern cuisines.